MASSIVE VOODOO: Hot MV News!! some jungle news dropping in. They are hot! First news are about the actual decrease on "Work in Progress posts" on Massive Voodoo. Those of you who read the blog for several years now might have seen the change. For example Roman's famous "Kong's WIP thoughts" -posts (like this one or this one) nearly got lost in the last year as we just did not find proper space to put them to the blog, just too much going on in form of other content for you readers. Nowadays you rather see more frequent finished miniatures and tutorials/step by steps about their genesis, which in fact is a good thing. Why you might ask? Well for us - behind the curtains of the MV blog - it means we are working much more with a schedule and are able to prepare ahead for our readers in the long run. No paniced posts of WIPs here and there, still enough stuff to fill the blog. The quality is rising in our eyes and we would like to know what you think? Something else is on the horizon. Roman is still showing his WIPs regularly, but not here on MV. For this cause he is now using a facebook artist page, Instagram and sooner or later there will be a fresh homepage for him, more like an Artist's portfolio, which is actually work in progress. Wait is Roman now abandoning MV? No, no, no, no, never would he. This does not change anything on MV and Roman's present, articles and stuff on MV. Massive Voodoo will always be Roman's baby and like the last years he will always work hard for new content in the jungle, MV workshops, MV event reports, MV competitions, finished models and much more. Roman decided to do this step as a blog is a blog and a homepage is a homepage. He explains himself like this: "Always when my mum tells me, that she is trying to show my work to her friends she ends up on the MV blog and does not know where to head. It is too much going on there. Not a big thing for frequent readers, but for my mum it is." 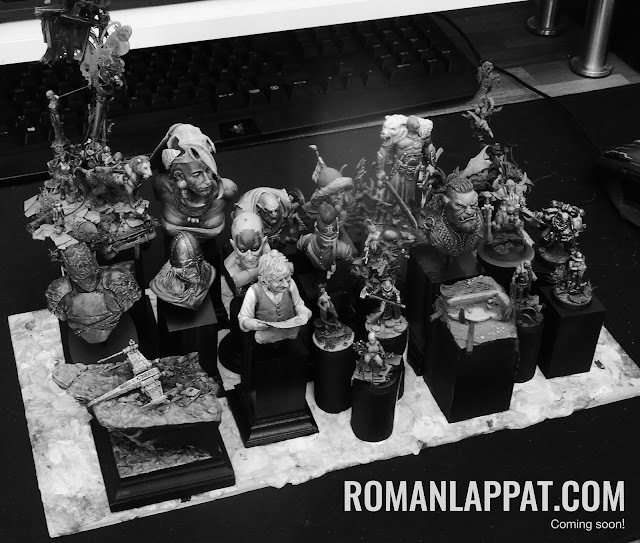 So a clear, focused homepage on the miniature artwork Roman is creating might be good solution. This is on his way now, you can call it Work in Progress atm. Well, one thing we did forget in the last couple of months is saying big thanks to the people on this world who support what we do on MV via their jungle donation. There are 0 Kommentare for Hot MV News! !